Dean will assume his new role in mid-March. A search for a new head coach will begin immediately. Georgetown ISD is providing the community online access to the most current Texas Academic Performance Report for the district and all GISD campuses. The Hammerlun Center for Leadership and Learning opens to the public on December 17. Parents and community members are invited to participate in the review of instructional materials being considered for adoption for Kindergarten-Grade 8 English Language Arts. GISD's newest middle school honored for innovative design. 67.4% of voters approved Proposition A, which is aimed to address future growth, safety and security and facility renovations. Change a life. Be a mentor. Georgetown ISD has announced that eight campuses have earned the U.S. Environmental Protection Agency’s ENERGY STAR® certification for superior energy performance. GISD has launched a new Mentor/Volunteer/Partner System (MVPS) to help recruit, manage and track volunteers across the district. School supply lists for the 2018-2019 academic year are available for download. Season tickets to GISD high school football games will be available for purchase starting August 6. See how GISD is using blended learning to redesign the student experience in math in this feature from Raise Your Hand Texas. Acosta has served as principal at McNeil High School in Round Rock for the last four years. The purpose of this program is to fund innovative and creative educational projects that align with the district’s Learner Profile and impact student learning. Georgetown ISD’s CTE program is becoming a national leader, and it’s thanks to a cohesive partnership between the school district and the community. 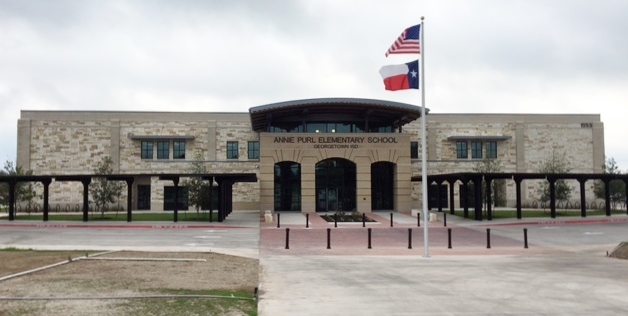 Georgetown ISD’s newest elementary school, Annie Purl Elementary, opened in August 2017, and was designed to support the district's Learner Profile, a strategic framework used to develop specific actions and measurable goals for instruction. This spring, that building was recognized by Learning by Design as an 2018 Outstanding Project. The Georgetown Independent School District Board of Trustees named Justin Del Bosque as the new principal for Forbes Middle School during its regularly scheduled meeting on Tuesday, April 17. You are invited to our Dual Language Program Parent Information Night. The goal is to increase public awareness and understanding, reduce stigma, and encourage local communities to focus on alcoholism and alcohol-related issues. The 2018 GISD Online Surplus Auction is live. Southwest Foodservice Excellence (SFE), the school district's food service partner, in connection with the district's Student Health Advisory Council and and the GISD School Nursing Staff will host a Health and Wellness Fair on Thursday, April 5 for students, parents and community members. The 2018-2019 GISD School Calendar is now available. GISD will be on spring break March 12-16.
he Stay Safe! Anonymous Online Reporting System is a provision for GISD students or parents to anonymously report or notify school officials of incidents or actions that may pose danger to individuals or the school. The 2016-17 Georgetown ISD Texas Academic Performance Report (TAPR) annual presentation will be held on Monday, January 29, 2018 at 5:00 p.m. in the GISD Board Room. The district's food service provider, SFE, posts daily lunch menus. You can review them online and through a free app. More details at georgetownisd.nutrislice.com. Join GISD in celebrating Career and Technical Education Month, a public awareness campaign that takes place each February to celebrate the value of CTE and the achievements and accomplishments of CTE programs across the country. The 2016-17 Federal Report Cards are available for the State of Texas, Georgetown ISD and each campus. UIL announced the newly realigned districts for 2018-2019. The Flippen Group named 134 schools in America to this prestigious list, only 6 of them are in central Texas, including Cooper and Frost. The 3rd Annual State of the District event on January 17 showcased student work across the district while Superintendent Dr. Fred Brent shared his perspective on what happens inside GISD. We are excited to launch the Superintendent’s Blog, a look at what’s happening Inside Georgetown schools from Dr. Fred Brent. Look for these monthly at www.georgetownisd.org/insideGISD. The goal of the Citizens Advisory Committee is to involve constituents of Georgetown Independent School District in evaluating the possible need for renovated and/or new facilities for the purpose of supporting quality educational programs. An official grand opening celebration and ribbon cutting event for Georgetown Independent School District’s newest campus, George Wagner Middle School, was held on Wednesday, Dec. 20 at the new campus, located at 1621 Rockride Lane in Georgetown. GHS Encore Show Choir presents “A Holiday to Remember” and the EVHS Choir presents "Jolly Holiday." George Wagner Middle School, Georgetown ISD’s newest campus, opened on Monday, Nov. 27. Citing a growing tax base and good financial management practices, Standard & Poor’s has upgraded the bond rating for Georgetown ISD to “AA” from “AA-” in its rating report released earlier this month. East View High School and Georgetown High School Choir students have advanced to Area auditions in January, at Midway High School in Waco. ll over Texas, students are finding their voices, setting goals, and taking steps toward securing their own successful futures as part of creating a movement called Generation Texas (GenTX). Would you like to learn more about GISD’s G/T services and identification? Do you think your student might be intellectually gifted and could benefit from gifted/talented services? GISD is auctioning off automotive parts, student & office furniture, cafeteria equipment, medical equipment and more online. Georgetown ISD Department of Guidance and Wellness will be administering a Student Needs Questionnaire to all high school students during the month of October. The School Health Advisory Council (SHAC) is a group of individuals representative of segments of the community, generally appointed by the school district to serve at the district level. The 2017-18 Free and Reduced Lunch application is now available. A new application is required every school year. If your student was on the Free and Reduced Lunch Program and you have not received a letter of approval for this year a new application needs to be submitted. Georgetown ISD Department of Guidance and Wellness is thrilled to host the Rachel’s Challenge program at all of our secondary schools at the end of September. “David’s Law,” legislation intended to combat cyberbullying (Senate Bill 179), went into effect September 1, 2017. This law makes it a Class A misdemeanor when a student harasses another through text messaging, email, cameras, social media, websites, applications or other electronic means. Georgetown ISD is hosting fall mentor trainings for the 2017-18 school year. All GISD mentors, including returning mentors and new mentors, must complete the application process for this new school year: submit a background check, complete a mentor profile and attend a mentor training. Georgetown ISD offers the opportunity for homeschooled students living in the GISD attendance zone currently in 8th, 9th, 10th and 11th grades to take the College Board’s PSAT test. GISD has completed the remarketing of $29,370,000 of variable rate debt for a 3-year term. In an effort to make it affordable for more families of GISD students to attend athletic events throughout the school year, GISD will offer passes for 2017-2018 Athletic events. Last year's season ticket holders for East View High School and Georgetown High School have the first option to renew season tickets beginning Monday, August 7, 2017 through Friday, August 18, 2017. You will receive an email with online renewal instructions the morning of August 7th. Board Brief from the June 19, 2017 regular board meeting. The Texas Economic Development Council has awarded the Georgetown Workforce Development Alliance (WDA) the 2017 Workforce Excellence Award. The WDA consists of a partnership between Georgetown ISD, the city of Georgetown and the Georgetown Chamber of Commerce. Georgetown ISD will be transitioning from Sodexo to Southwest Foods Excellence as the district’s food services provider. Southwest Food Excellence has announced that Tray Mitchell has been hired as the Georgetown ISD Director of Nutritional Services and will begin on July 1. Watch the GHS and EVHS graduation live from the HEB Center at http://bit.ly/2pmjDqf. As you are aware, we are preparing for the opening of a new Annie Purl Elementary that will serve students from the current Annie Purl and Williams campuses. Over the next couple of weeks, Georgetown ISD will be reassessing the bus service area around Annie Purl Elementary for the 2017- 2018 school year. It is the normal practice of GISD that each time a new campus is built or attendance zones are changed, we review the transportation zones for those affected areas. The purpose of this assessment is to create service zones that are consistent with all other schools in the district and provide the best services possible for all students. Georgetown Independent School District announces the sponsorship of the 2017 Seamless Summer Foodservice Program. Public session begins at 7 p.m.
Summer is just around the corner and GISD has opened registration for summer school. Georgetown ISD is holding a series of education summits to discuss the development of a community-based accountability system. GISD will offer a public presentation on Monday, May 8, 2017 at 5:30 pm in the Georgetown ISD Board Room. Georgetown ISD is offering opportunities during the 2016-17 school year for secondary students to earn credit in academic subjects and for elementary students to accelerate a grade level by passing the appropriate examinations for acceleration. Georgetown ISD is proud to now offer a Dual Language Enrichment Program to incoming kindergartners for the 2017-2018 school year. This program can also be referred to as a two-way immersion program. On Monday, the Georgetown ISD Board of Trustees named Dr. Brandon Jayroe as the new principal of Benold Middle School and Rob Dyer as the new principal for Richarte High School. Find out more information on Kindergarten and Pre-Kindergarten Enrollment at GISD. The event will be held Saturday, April 22 at the Georgetown Recreation Center. The next general election is just around the corner. On the ballot you will see a proposition related to our school district’s funding known as Chapter 41 recapture. Georgetown ISD is Listening! Let's Talk! We want every family in Georgetown ISD to be involved in their child’s education, knowing they make a difference and that their voice is heard. Looking for something fun to do this summer? There are plenty of summer camps right here in Georgetown. GHS Baseball and Softball will raise awareness for Pediatric cancer by wearing gold next week during their Spring Break games. All campuses will have STAAR Exams next week. The Board of Trustees met on February 21 for a regular board meeting. Congratulations to the Eagles and Lady Eagles! The Board approved Dr. Malinda Golden, Lannon Heflin, and Denisse Baldwin at the regular board meeting on Feb. 21. The Board meets at 6 p.m., but immediately goes into closed session. Public session begins at 7 p.m. There will be 240 teams from over 8 counties showcasing their solutions to Challenges at a tournament on Saturday, February 18, beginning at 8 a.m. The 2016-2017 Annual GISD Surplus Auction will go live on Tuesday, February 21 and continue through Thursday, March 2. GISD Superintendent Dr. Fred Brent received the Cornerstone Award for Education at the eighth annual Community Impact Summit and Cornerstone Awards held at the Chamber of Commerce last week. Join us at both EVHS and GHS Girl's Basketball games. Georgetown ISD student-athletes from East View and Georgetown High School participated in the annual National Signing Day on February 1. A complete list of 2017 UIL Results can be found here. National School Counseling Week, sponsored by the American School Counselor Association (ASCA), will be celebrated from February 6–10, 2017. The Board discussed a rezoning update, District of Innovation and approved a resolution opposing the A-F Rating System. GISD will host a Spanish language public meeting on the rezoning of attendance boundaries on Thursday, February 9, 2017 at the Mitchell Elementary library, located at 1601 Rockride Lane. 5th to 6th Grade Parent Orientation Meetings this Wednesday, January 25, 2017. A national independent credit rating agency, Moody's Investors Service, has upgraded Georgetown Independent School District’s debt rating from Aa2 to Aa1. Public session begins at 7:00 pm. Based on our original rezoning timeline, we intended to bring proposed attendance zones to the Board for approval at the January School Board meeting. However, additional time is needed to respond to questions and feedback received online and at the public meetings held on January 5 and January 10. PSAT/NMSQ Student Score Reports for all high school students that completed the fall exam will be disseminated on January 25, 2017. In 2010, the Georgetown community passed a bond to renovate and expand the existing Georgetown High School campus to accommodate an increase in student enrollment, make the campus more user-friendly and to update the interior spaces of the building. The Georgetown ISD Board of Trustees approved the District’s Board Beliefs and received updates on the new elementary and middle school boundaries at the Dec. 14 regular Board meeting. We are excited to announce that Kirby Campbell has been hired as the Georgetown ISD Director of Transportation and will begin on January 2. Georgetown ISD is providing the community online access to the most current School Report Cards (SRCs) for all GISD campuses. On Friday, December 16, students will be released early and teachers will use the afternoon as a work day to wrap up the semester. We would love to showcase our history by collecting big or small artifact donations from the past 100 years. Information on the Jack Frost Invitational Basketball Tournament is available here. The 3rd Quarter 2016 Demographic Report for Georgetown ISD is now available to view. The Georgetown Independent School District Board of Trustees appointed Ben Stewart as the replacement for Place 7 trustee Ronna Johnson at their Monday, Nov. 14 Board meeting. Together with the GHS Georgettes and the EVHS Sparklers, GISD Council of PTAs is offering a babysitting service open to GISD students to help alleviate some holiday stress. We are needing volunteers for Destination Imagination. Examination for Acceleration Registration Forms due by November 8th. Georgetown ISD offers opportunities for students to earn credit in subjects without prior instruction. The district will be honoring veterans this year with a variety of programs and ceremonies held throughout the day on Veterans Day, Friday, Nov. 11. A student may be referred by teachers, counselors, parents, or any adult knowledgeable of the student. Once a student is referred for assessment, a variety of information is gathered on each student. No single test score or referral will qualify a child for G/T services. GISD is inviting the Georgetown community to submit mascot ideas for George Wagner Middle School. You are cordially invited to attend the NJROTC Liberty Battalion's 14th Annual Military Inspection. As a part of Texas Safe Schools Week, the Texas Department of Public Safety has highway patrol troopers riding buses and monitoring drivers across the state, Oct. 16-22. Frost PE and the City of Georgetown are encouraging families to walk or bike their child to school. Students in Georgetown will join those from all over the U.S. walking or riding their bike to school on October 5. Georgetown ISD is hosting a First Responder’s Night on September 30 at 7:00 pm at the GHS vs. EVHS football game. First responder’s in uniform will be admitted into the game for free. GHS to host 2016 GISD College Fair on September 27, 2016. A Georgetown ISD school bus was involved in an accident this morning at the intersection of Rockride Lane and Sam Houston Avenue. There were no students on the bus at the time of the accident. The PSAT for 10th and 11th grade students will be held on Wednesday, October 19th at each of the GISD high school campuses. Registration opens August 8, 2016, and ends September 23, 2016, at 5:00 p.m. (CT). Examinees who do not register by September 23, 2016, must be registered by campus personnel at a participating campus on the day of testing, if the campus can accommodate them. A list of submitted nominations for the name of Middle School # 4 was presented to the GISD School Board on August 15, 2016. Following GISD Board Policy, the district began soliciting nominations from the community on July 16, 2016 with a deadline of August 10, 2016. If you were unable to attend one of our new student enrollment events the week of August 1, please click above for information on how to enroll your child before the first day of school. School starts on August 23. Lisa Napper has been named Assistant Superintendent of Human Resources, replacing Karen Dooley who recently announced her retirement from Georgetown ISD. Napper will begin serving in the district August 22. Click the headline above to learn more about Ms. Napper. 2016 Varsity Football Season Tickets are open to the public today. GISD is seeking nominations for the name of Middle School #4. Click the headline above to read about criteria for facility names and to access the online nomination form. The deadline for submitting nominations is August 10. The groundbreaking ceremony for the New Purl Elementary School will take place on August 29 at 6:30 p.m. The Georgetown Independent School District is seeking membership for the District Performance Council. Parents, community members, and business members are needed. Click the headline above for details on how to nominate yourself or someone else. The July 2016 meeting of the Board of Trustees has been moved to July 25, the fourth Monday of the month. Click the headline above for more details on GISD Board of Trustees meetings. The Georgetown ISD Education Foundation invites local businesses and non-profit organizations to participate in Georgetown ISD's annual Community Showcase, which will be held on Wednesday, August 10. Click the headline above for more details. The Georgetown Area Junior Forum's 9th Annual Fill the Bus campaign to collect school supplies for GISD students in need kicks off July 1 and runs through August 7. Click the headline above for information on donation locations. A meet-and-greet for newly appointed GHS principal Wes Vanicek has been scheduled for Tuesday, July 19. Click the headline above for more details. The Georgetown ISD Board of Trustees named Wes Vanicek as the new principal for Georgetown High School at its regular meeting on Monday, June 20. Click the headline above to read more about Mr. Vanicek as well as another change in GHS administration. The Georgetown ISD Board of Trustees named the new principal for Ford Elementary and the new principal for Middle School #4 at its meeting on May 16. Click the headline above to learn about the new campus leaders coming to our district. The celebration of Veterans Day is a long-standing tradition in Georgetown ISD. The district will be honoring veterans this year with a variety of programs and ceremonies held throughout the day on Veterans Day, Wednesday, November 11th. We invite veterans and active military members in our community to join us at any of these celebrations. Click the headline above for details.